The Department of State’s new FOIA site. 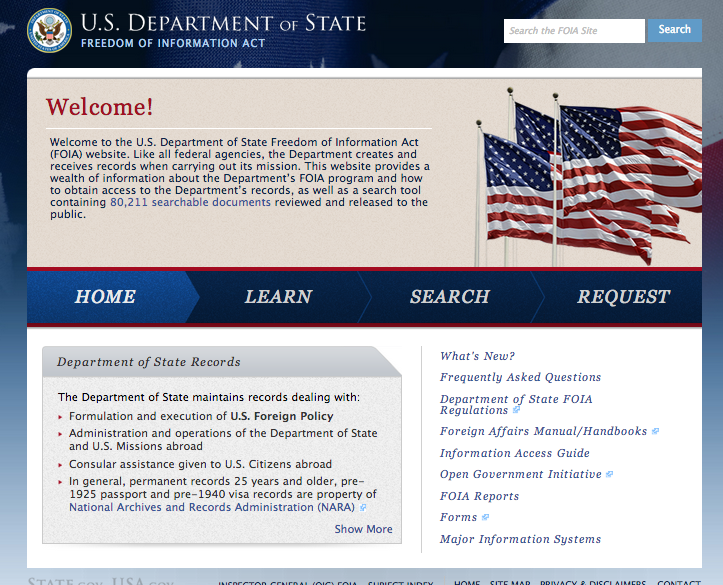 The Department of State just launched its new FOIA website, and it’s impressive. The site is sleek, informative, user-friendly, and the best feature, in my opinion, is the new virtual reading room search. The new search proudly boasts a total of 80,211 searchable documents—for now, that is, the number of searchable documents will continue to grow—and clearly indicates when the last documents were added. I tested out the new function by performing a search for ‘Prudence Bushnell,’ the Deputy Assistant Secretary of State for African Affairs at the time of the Rwandan genocide and the Ambassador to Kenya during the Kenyan Embassy bombings, and was soon greeted with 66 responsive documents. The pdf documents are high-resolution, easy to read, and the search responses are navigated with the document’s date, origin, and case number (when available) clearly displayed. State’s new FOIA site has a lot more than just a new search function, though. The crisp-looking site has its FOIA regulations, FOIA reports, and other helpful links on the splash page, as well as a user-friendly ‘Learn’ tab to help requesters navigate sending their FOIA and MDR requests. You can still make your Department of State FOIA requests electronically, and the new site makes it easier to see how and where to do so. As a frequent FOIA requester and appealer, I was very impressed. It shows that the Department cares about its FOIA processes and the requester, and the site is clearly designed with the requester in mind. Well done. The Department of State is taking initiative to improve its FOIA performance and deserves a lot of credit, though Judiciary Committee Chairman Senator Patrick Leahy’s recent speech before Congress for the Freedom of Information Act’s anniversary underscored that the government as a whole must “do a better job.” Noting a recent study by the Pew Research Center, Leahy reminded Congress of what they surely already know, that trust in the federal government is at a historic low and that a majority of Americans believe the federal government is a threat to their personal rights and freedoms. While the causes of distrust are multifaceted, Leahy stated that transparency is a singularly powerful, proven remedy for civic distrust. The Senator cited the Archive’s latest audit on outdated agency FOIA regulations as proof that the government needs to do a better job prioritizing FOIA and open government, and bolstering the FOIA would benefit both the public and federal agencies. It also wouldn’t hurt elected officials trying to earn back their constituents’ trust. 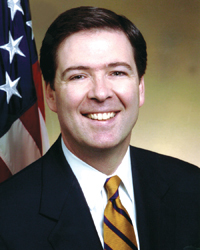 Prospective FBI director, James B. Comey. The defense phase of the highly publicized Bradley Manning court martial began this week with the screening of the 39 minute ‘Collateral Murder’ video before a packed courtroom. The video, which the military refused to release, spurred Manning to leak troves of records to WikiLeaks and is the basis for the espionage charge against him. The cockpit video comes from the US Army helicopter involved in the 2007 Baghdad attack that killed 11 men, including a Reuters journalist and his driver, and records the aircrew laughing, calling the victims the Army later determined the crew reasonably mistook as enemy combatants, as “dead bastards.” Reuters submitted a FOIA request for the video documenting the death of its journalist, but CENTCOM never released the video through official channels, at one point even claiming it couldn’t find a copy of it. An expert witness called by the defense, Colonel Morris Davis, who served as chief prosecutor in the Guantánamo military commissions between 2005 and 2007, testified that the files leaked regarding detainees at the camp were already freely available, and their disclosure would not have harmed US national security. A federal judge in D.C. has ordered that the Department of Homeland Security release its processed files on Aaron Swartz, the computer programmer who committed suicide after being charged by federal prosecutors for illegally accessing JSTOR articles, in response to a FOIA lawsuit. The FOIA suit was brought after the Secret Service denied in full a FOIA request for its files on Swartz, arguing they were being used in an ongoing legal investigation. An appeal of the denial conceded that the exemption used to deny the material was no longer valid, yet no documents were ever provided. The recent ruling compels DHS to finally produce the files on Swartz it has already processed, and gives the government until August 5 to provide a timetable for releasing all responsive documents. State’s example should put to rest for good the red herrings of “classified systems” and “508 compliance” that other federal agencies are using to avoid creating comprehensive FOIA portals and reading rooms.